This plaquette has been combined with four other plaquettes (1957.14.60.1-.3,.5) and a plain panel to make a partially lidded box, of which this plaquette is the left short side. 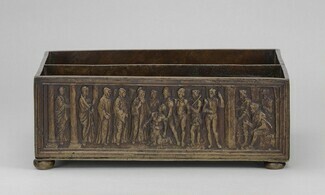 The plain panel serves as the bottom of the box, and on its underside are markings for each of the plaquettes. Relevant to 1957.14.60.4 are: D478 in red paint (unidentified collection), 395 in white paint (Molinier 1886) canceled by a red bar, 270 in red paint (Dreyfus), and C54 C in red paint (Ricci 1931). Molinier, Émile. Les Bronzes de la Renaissance. Les Plaquettes; Catalogue Raisonné. 2 vols. Paris, 1886: 2:41, no. 395, as Paduan school, Scene from the Life of a Saint. Migeon, Gaston. "La collection de M. Gustave Dreyfus, V: Les plaquettes." Les Arts 80 (August 1908): 29, fig. 7, as Paduan school, Scene from the Life of a Saint. Ricci, Seymour de. The Gustave Dreyfus Collection: Renaissance Bronzes. Oxford, 1931: 64, no. 54-C, pl. 32, fig. 54-C, as Paduan school, Scene from the Life of a Saint, c. 1500. Middeldorf, Ulrich and Oswald Goetz. Medals and Plaquettes from the Sigmund Morgenroth Collection. Chicago, 1944: 36–37, no. 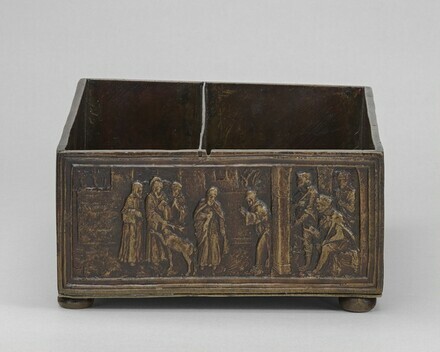 261, note, as Mantuan, c. 1500, [Scene from] the Life of Saint Simeon. Renaissance Bronzes: Statuettes, Reliefs and Plaquettes, Medals and Coins from the Kress Collection. Introduction by Perry B. Cott. 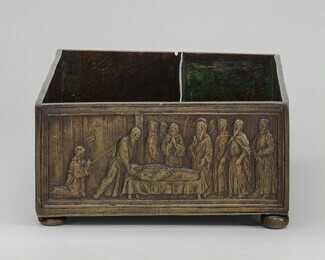 National Gallery of Art, Washington, 1951: 137, as Paduan sixteenth century, Casket with Scenes from the Life of a Saint. Pope-Hennessy, John W. Renaissance Bronzes from the Samuel H. Kress Collection: Reliefs, Plaquettes, Statuettes, Utensils and Mortars. London, 1965: 143–144, no. 525 (iv), fig. 524, as North Italian late fifteenth or early sixteenth century, Scene from the Life of Saint Simeon of Podirolo. Wilson, Carolyn C. Renaissance Small Bronze Sculpture and Associated Decorative Arts at the National Gallery of Art. Washington, 1983: 50, no. 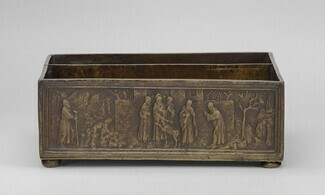 8, as North Italian, possibly Mantuan, c. 1500, Scene from the Life of Saint Simeon of Podirolo. Van Waveren-Hooft, Eliane. "Le Placchette con le 'Storie di San Simeone': Contesto e stile di un manufatto rinascimentale emigrato." In Piva, Paolo and Maria-Rosa Simonelli, eds. Storia di San Benedetto Polirone. L'età della soppressione. Bologna, 2001: 170, fig. 2 bis, as possibly related to Bartolomeo Spani (c. 1500? ).